Want to have some fun on a budget? There is no better time to explore Northern Arizona doing things that don't break the bank. Take your family, friends or enjoy some time alone exploring any or all of the 12 unique activities listed below. Experience historic towns, mountains, lakes, forests, culture, and the spectacular scenery that surrounds the communities of Williams, Page/Lake Powell, the Navajo Nation, and the Hopi Mesas. Just a few hours away from Phoenix, Northern Arizona offers dozens of free things to do. Take a walking tour of the historic district in Williams and step back in time. See Pete's Route 66 Gas Station Museum, Twisters, Route 66 Place (with a real working soda fountain), Wild West Junction, and much more. Pick up the Historical Walking Tour map at the Williams & Forest Service Visitor Center located in the original train depot right on the Mother Road. Williams is located in a gigantic volcano field and one of its most interesting features is a lava cave. This mile-long lava cave was formed roughly 700,000 years ago from a volcanic vent in nearby Hart Prairie. While hiking in the lava cave you are able to see first hand how it was formed by the small wave-like undulations on the floor to the stone icicles hanging from the ceiling. The Lava Caves are located northeast of Williams off I-40 at exit #185. Take the frontage west to FR171 and follow the signs. In addition to being The Gateway to the Grand Canyon, Williams is a mountain town. The Bill Williams Mountain Top Drive is noted as "one of the finest scenic drives in Arizona". Just head out of town on Fourth Street and suddenly you are in the Ponderosa Pine Forest climbing high above the town of Williams. The forest road is passenger car friendly and hiking and biking trails are abundant. Pick up your map or Guidebook at the Williams and Kaibab National Forest Visitor Center. Picnic along the way and enjoy the gorgeous trees & sites to explore. This park is the only tribally owned zoo in the country that has had indigenous wild animals since 1962. Here animals reside in truly natural habitats surrounded by native vegetation and rock scenery. Most animals here are native to the Navajo Nation and a part of the zoo's dedication to exhibiting animals and plants important to the history and culture of the Navajo people. Free admission Mon.-Sat., closed Sundays and holidays. One of the longest continuously inhabited landscapes of North America; the cultural resources of Canyon de Chelly include distinctive architecture, artifacts, and rock art, all remarkably preserved. Canyon de Chelly also sustains a living community of Navajo people, who are connected to a landscape of great historical and spiritual significance. Visitor Center is open daily, closed Christmas. North & South Rim Drives, and White House Trail remain open all year. 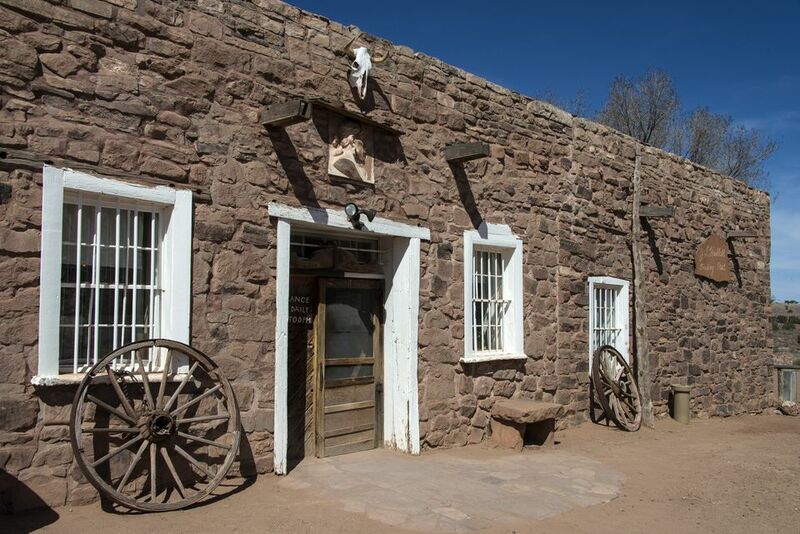 The oldest continuously operating trading post on the Navajo Nation. Purchased by John Lorenzo Hubbell in 1878, this historic spot on Navajo Nation supplied new things to the Navajo years ago. Now operated by Western National Parks Association, a non-profit co-operating Association they carry-on the trading business the Hubbell family established. Located on state highway 264 between Window Rock and the Hopi Villages. One of the most spectacular views in the west awaits at the end of an easy 3/4 mile hike. The trail leads to an overlook where, far below (straight down), the swirling waters of the Colorado River make a complete horseshoe turn around an enormous free-standing sandstone butte. Bring your camera! Just 2 miles south of Page on U.S. Hwy. 89, look for an unpaved road that leads to a parking area to the west near mile marker 545. Lake Powell's Hanging Gardens is east of Glen Canyon Bridge, the trailhead is located 500 yards off Hwy. 89. Hanging gardens are spring-fed colonies of plants clinging to the vertical wall of a cliff. They are often formed in alcoves or "glens" where conditions are cooler than that of the surrounding desert. Lake Powell's Hanging Gardens may be the most unusual form of spring-supported plant community life found on the Colorado Plateau. Take in the incredible views as you circumnavigate the community of Page situated on a mesa overlooking Lake Powell. Rimview Trail is an approximately 9.75-mile loop that offers wonderful views of Lake Powell, Tower Butte, and Navajo Mountain. To the south is the Colorado Plateau, stretching as far as the eyes can see. In fact, most of the land seen from here belongs to the Navajo Nation. To the west is the Vermilion Cliffs-known for their distinctive red-purple hue. Get up close and personal with dinosaur tracks that were left millions of years ago. Several different types of dinosaurs are represented by their tracks at this site. The hike is fairly easy and mostly flat; it winds around several stone spires and past hundreds of tracks. There are usually Native American guides at the parking area who are willing to guide you around the site and tell you the legends and science behind the tracks. Located near Tuba City and the Hopi Village of Moenkopi. You may be tempted to buy a special remembrance of a visit to the Hopi Villages, but stopping in the stores along state route 264 is a great way to meet and visit with Hopi artists. Basket makers, Kachina carvers, silversmiths... some of the most distinctive Native American art in the west is on display. A great place to begin is in the TUUVI Travel Center stores across the street from the brand new Moenkopi Legacy Inn. Self-guided mapped routes sanctioned by the AVA Walking Organization can be found in Northern Arizona. Look for walks in Flagstaff and Sedona. All Volkssport walks are open to the public.